A comfortable, SHOWA flexible glove that is resistant to abrasion and very pleasant to wear ultra-comfortable clove in cold work conditions. Showa 451 protects the hand in damp environments or against aggressive detergents or alcohols. Surface provides tactile feel and better grip, breathable back of hand to reduce perspiration. Greater hygiene and comfort, no irritation by seams in contact with the skin. CAT Latex Palm Gloves offer outstanding hardwearing hand protection, including both comfort and usability. The elasticated cuffs ensure a tight fit every time. Complies to safety standard CE EN388(2243). 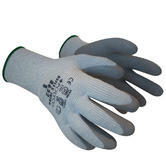 Caterpillar 1741 thermal gripster gloves are an acrylic knitted glove with a high grip latex palm. Perfect for conditions where a warm agile glove is essential. The brushed lining makes gloves perfect for warmth and comfort. Full latex coated palm and fingers. Elasticated knitted wrist for a tight fit. Complies with CE EN 388 (2243) safety standards. Manufactured from high quality leather to provide a strong, durable glove. The index finger area is reinforced adding extra protection in this vital area. The rubberised safety cuff adds extended protection and security. 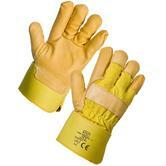 Supertouch Rigger 21643 Yellow Hide Glove conforms to EN388 3.2.2.1 safety standards. Ideal for general handling tasks. Ideal for all general handling purposes in all weather conditions. Designed with a knitted wrist for improved user comfort. The latex palms are textured for added grip. SuperTouch 61061-5 Topaz Ice Plus Thermal Glove conforms to EN388 3.2.4.2 & EN511 X-2-X safety standards. All-round ox leather glove with reinforcement on index finger. A-grade cow leather glove, fully lined with rubberised safety cuff. Suited for high durability work in general mechanical industries & heavy duty applications. These glove have a unique HPT foam ¾ coating which remains flexible to temperatures as low as -50ºc. 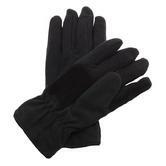 Breathable two-layer insulated liner also ensures that these gloves always remain warm, soft and comfortable. Ideal for applications involving secure handling and high levels of dexterity. 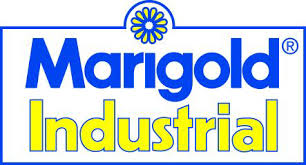 Approved to EN 388:2003 and BS EN 511:2006. These acrylic knitted gloves from Blackrock feature 40g Thinsulate lined insulation, and have elasticated cuffs to keep the cold out and the heat in. Natural latex coating on a seamless liner with ATG's patented Non-Slip-Grip technology. Typical Applications: Cold Storage, transport, construction, forestry, off-shore energy, airport baggage handling, transportation, shipping and recieving. General handling in cold and wet conditions, building materials, timber, refuse, engineering components. Brushed liner is soft and comfortable and keeps warm in cold conditions. Compliant with EN 388 1.2.4.1 standard. Manufactured from full grain cowhide leather with a cotton fleece interior lining. The combination of materials makes these gloves both comfortable and durable. The elasticated cuff ensures a secure and comfortable fit for all users. This multi purpose is ideal for many tasks including low temperature tasks. Conforms to EN388 2.1.4.3 Safety Standards. 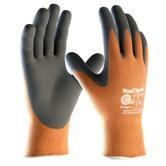 Reinforced, Comfort safety glove with excellent grip in wet environments. Gloves with no seams on the working surfaces providing exceptionally comfortable. Superior comfort with excellent flexibility of natural latex. Exceptional thermal insulation, keeps hands warm. Elasticated wrist band provides a more secure fit. Ideal for manual handling tasks (waste collection, forestry and other). Mapa Harpon 319 Latex Glove conforms to EN 388 2.1.4.1 safety gloves standards. Ansell 78-103 offer a cost-effective solution for a range of food industry applications, where protection from cold is needed. 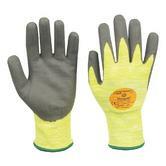 Ideal choice for use under cut resistant or chemical resistant gloves. Seamless design, thermal Insulating glove, ensures excellent flexibility and high dexterity. Ansell Versatouch 78-103 gloves are 100% latex-free, eliminating the risk of type I allergies. Can be used for a very of food processing applications: Storage Areas, Handling of frozen products, Transportation. Conforms to EN388: 1.1.3.X and EN 511 – 010 safety standards. 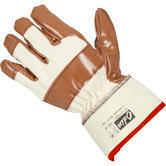 Medium duty work glove with fleecy liner and crinkle finish latex coating. The Reflex Therm safeguards protecting from mechanical hazards while keeping your hands warm and comfortable. The durable crinkle latex palm coating provides excellent grip in both dry and wet conditions, highly elastic - making it extremely flexible. 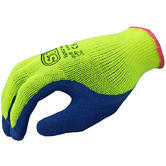 The elasticated knit wrist ensures a secure fit and also keeps the hands free from dust and debris. A very comfortable glove from Polyco with excellent grip, the Reflex Therm is a perfect choice for outdoor general handling tasks. Polyco Reflex Therm - Cold Resistant Glove conforms to: EN388 2.2.4.2. EN511 0.2.X. standards. The Trekmates STCH2 Black Dry Classic Gloves are manufactured with a waterproof, windproof and breathable shell. Its a perfect, year round, outdoor glove that provides warmth without weight. The textured palm - ensures maximum grip in wet or dry conditions; The pre-curved fingers offer a more comfortable fit and better dexterity. The elasticated wrist and long cuff with drawcord closure. This cuts out cold winds and prevents winter chills from getting up your sleeves. An excellent choice for winter walking or everyday use. Its a smart, neat glove, yet resilient enough to be used as standard issue gloves by Scottish Police braving harsh, bitter, wet Northern winters. ...And its made by Trekmates - the specialist outdoor brand - so you know they will protect you and be long lasting. These are wider uses for these Regatta gloves and that incorporates the leisure side of your life. If you like venturing out into the great outdoors whatever you activity these gloves offer great performance. Thermal Balance fleece provides outstanding warmth and comfort, making it the ideal layering garment for a range of outdoor uses. Showa glove - Unique combination of cold protection and tactical grip performance glove. 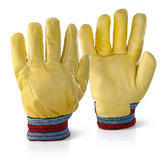 SHOWA 477 is ergonomically designed to keep your hands dry and warm in the gold environments. Cold protection with Insulated liner, which provides barrier from cold ensuring warmth and comfort. Fully double engineered coating keeps your hand dry and protects against liquids or water penetration. Ergonomic design that replicates the natural curvature of a human hand and so reduces hand fatigue. Highly flexible and resistant to tearing and abrasion. Insulated with a fixed acrylic terry liner; keeps hand warm and comfortable. Liner is seamless for reduced irritation. Conforms to: EN388: 2003 4.2.3.1. and EN511: 2006 standards. Impregnated, nitrile coated, Canadian-style, driver glove on a jersey winter liner, with 7cm canvas safety cuff. These driver or rigger gloves are for use with metal goods and components, automotive industry, construction, general purpose offshore and operating machinery. Soft jersey lining increases the glove's comfort and cold insulation. Available Length: 27cm and Sizes: 9, 10. For extreme cold weather gloves we recommend gloves with wrist closure and long cuffs: that will prevent cold air, wind and snow from sneaking in. Northseaworkwear offers a variety of freezer gloves or cold climate gloves 9Whetehr you call therm Thermal gloves or Insulated gloves or cold weather gloves, it doesnt matter: we have them all!, adn makde byt th best manufactureres, including Ansell, Blackrock, Caterpillar, Polyco, Regatta, Showa, Trekmates and Wenaas. Consider the Showa Argon three quarters dipped, thermal insulated freezer glove: great glove, keen price and very popular. Our freezer gloves as used across all cold climate jobs in a range of industries including food manufacturing, automotive, warehouse and general outdoor work. These gloves offer protection against cold risks whilst still providing protection against mechanical hazards. or if you need a thermal liner for inside your regular gloves, consider the Ansell Therm a Knit fleece liner glove..